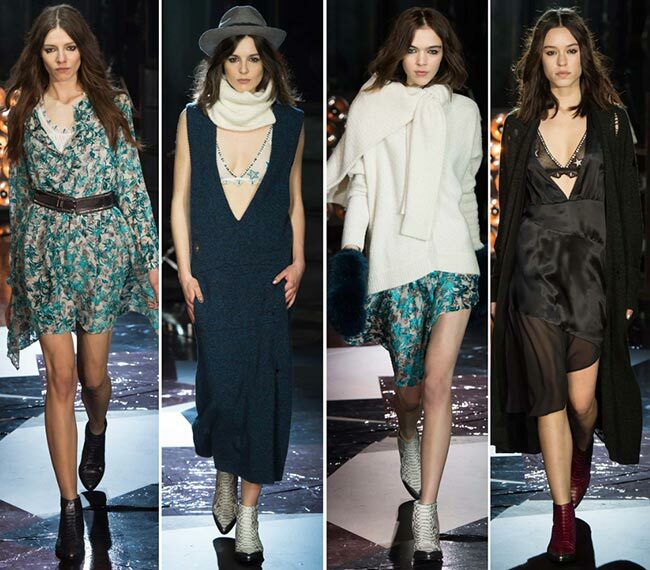 After a colorful sporty chic spring collection, French brand Zadig & Voltaire goes back to its rock ‘n’ roll roots enchanting the world with the brand-new Zadig & Voltaire fall/winter 2015-2016 collection that has just rocked Paris Fashion Week. Titled Midnight Vagabond, the new collection also marks a new beginning, as Paulo Melim Andersson has joined the team to co-design the womenswear and accessories along with the brand’s creative director Cecilia B‚Äö√†√∂‚Äö√†√ánstr‚Äö√†√∂‚Äö√†√ám. Saying that they have done an amazing job would mean saying nothing, as the entire 33 looks long collection wins our admiration from the very first sight with its relaxed and utterly wearable designs that come drenched in boldness, glamour and rock attitude. 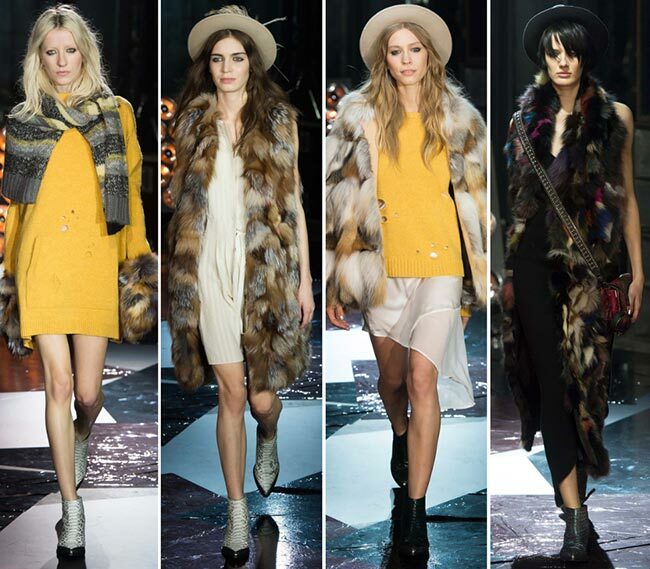 From the materials and the color palette used to the tiny details and the smart layering techniques, the Zadig & Voltaire fall 2015 rtw collection has lots of aspects to become your favorite source of inspiration for getting your wardrobe fall ready come the cold months. Saying rock, we of course mean an abundance of black, leather and studs, which have got unique interpretations in the Zadig & Voltaire fall collection. Solid black is actually the protagonist color throughout the collection, however, we are also treated to splashes of yellow, white, cream, blue, khaki, brown and gray alongside the tiny motifs of Marsala wine acting as contrasting accents mainly appearing either on the footwear or the handbags. We love the way different styles and fabrics have been combined in single looks, while zips, studs and pretty stars galore act as final brushstrokes for perfecting the looks and injecting the right dose of the rock ‘n’ roll spin to them. We see lots of short lengths putting the focus on the bare legs of the models, and this is exactly the way the show kicked off bringing a super-mini studded skirt with a tiny slit on one of the legs, which is teamed with a black mesh knit sweater and a back leather belt. This is bold, glam and rock and it’s designed for the self-confident Zadig & Voltaire girl, who needs no flashing colors or too many details for standing out in the crowd. We see classic menswear inspired motifs as well, like the pinstripe cropped jumpsuit that is again embellished with studs and is worn with a biker leather jacket to keep the mood of the collection. And although rock ‘n’ roll is the primary focus of the entire line-up, we also discover subtle Seventies inspirations exercised through the brown suedes, as well as romantic dresses featuring delicate fabrics, pretty embroidery and prints for those boho-chic girly girls, looking for lovely alternatives to all those black leather designs. There are even soft lingerie-style inspirations brought to life through the parade of slip-dresses and tops utilizing the same lightweight fabrics and interesting asymmetric hemlines. We have leather and we have fur galore, coming as cozy and chic outerwear options and using colors ranging from the classic whites and browns to psychedelic color-blocked options in much subdued hues. And since winter is about a warm and comfy style, the Zadig & Voltaire fall/winter 2015-2016 collection also offers stylish knitting from scarfs and sweaters to casual sweater-dresses with holes. Add tweeds and pinstripe pantsuits with the blazer featuring Eighties squared shoulders and you get a super-diverse and functional collection ready to dress you creatively for different occasions. Equally stunning is the accessory selection of the collection, bringing oversized over-the-shoulder bags and pointy-toe metallic python leather Mod	booties, quilted felt hats with frayed edges and feathers, but also big fluffy fur gloves that seem to be shaping a whole new trend for the fall to come. While the hair of the models is kept loose and casual with a deep center part, the makeup is natural with the accent placed on the black eyeliner smudged on the lower lash line. Wholly, it was a beautiful, energizing and cool show that taught us many a style lesson for looking easy breezy lemon squeezy this fall!